On Friday AT&T’s Next device upgrade program officially goes live, so we thought this would be an excellent time to compare the value of the three trade-in plans so far announced: Next, Verizon’s Edge, which launches on Aug. 25 and T-Mobile’s already available Jump. 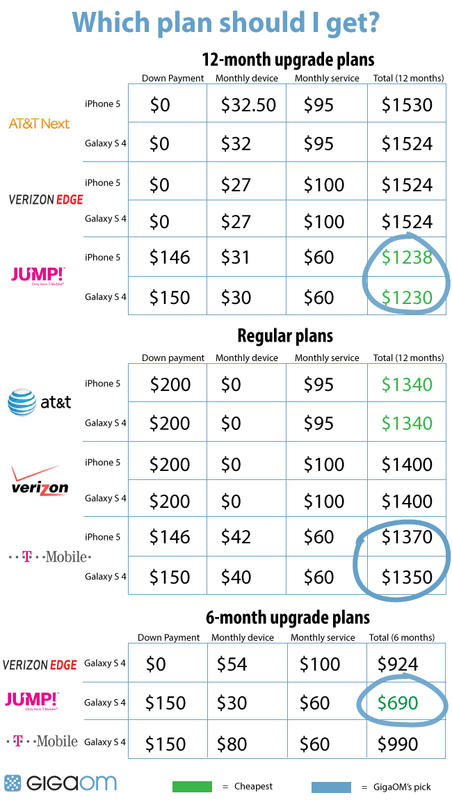 Kevin Tofel and I decided put our own twist on the analysis, though, so we compared these upgrade programs against the three carriers’ regular service plans to give you an idea of how they stack up after a full year of service. Our conclusion: T-Mobile definitely has the best deal of three upgrade programs, but in our minds the best deal wasn’t Jump. If you’re looking to upgrade to a new phone once every year, you’re far better off buying your device and signing up for T-Mo’s regular inexpensive service plans. Update: About an hour after we published this, T-Mobile announced a new limited time promotion this summer that eliminates any down payments on its devices. When combined with Jump, that promotion significantly reduces the overall cost of using its upgrade program. Our original analysis and charts still apply because they show T-Mobile’s regular rates, but we’ve made a note of how the promotion would affect overall costs below. I’ll explain our reasoning in a moment, but first lets get to the raw numbers and the methodology we used. Keep in mind there’s a lot of complexity to this. There is no way to compare them side-by-side since they all charge for devices and programs in different ways. This going to take a bit of explaining, so bear with me. We used both the 16GB iPhone 5 and 16GB Samsung Galaxy S 4 as reference devices, showing the down and monthly device and program payments you’d pay for each. We also included the cost of a monthly service plan (unlimited voice and text plus 2 GB of data). We focused on a 12-month upgrade horizon because we feel that’s when most people would want to upgrade to their devices. But since the math of these plans works out vastly different depending on your upgrade timeline, we also calculated costs after six months for Verizon and T-Mobile on a Galaxy S 4 (AT&T doesn’t have a six-month option). For the regular plans, we calculated what you would pay at AT&T and Verizon if you just signed a regular two-year contract, while for T-Mobile we figured out what your total costs would be if you paid off your phone in both 12 months and 6 months. We realize this isn’t an apple-to-apples comparison, since after a year on AT&T and Verizon’s regular plans, you’re still bound to another year of contract and can’t “upgrade” your device. But we wanted to give you an idea of what your costs would be if you opted out of upgrade plans. This analysis is particular important for T-Mobile’s regular unsubsidized plans because you’re free to get a new device as soon as you finish paying off your last one. As you can see, if you’re upgrading every year, T-Mobile’s Jump program beats all of the others in total costs, but we still feel T-Mobile’s regular plans are a better deal even though you wind up paying $120 to $130 more at the end of the year (though we should note that under T-Mobile’s temporary zero-down promotion, the difference is bigger: $206 for an iPhone 5). The reason this is a better value is simple: you get to keep your phone. If you’re keeping up with Apple or Samsung’s device refresh cycle, then a year-old iPhone or Galaxy is still worth quite a lot of money. As Mr. Tofel likes to put it, we’re building equity in our devices. But on all of these upgrade plans we’re basically throwing that equity away. Imagine buying a home with a loan, making all but your final mortgage payments and then just giving your house back to the bank. That’s basically what you’re doing with these programs. AT&T and Verizon’s programs are particularly bad because they’re charging you two mortgage payments. You’re making a monthly Next or Edge device payment, but they’re also charging you the same service rates as contract customers, which include device costs. That’s why T-Mobile’s service rates are so much cheaper — it makes you pay for your device separately. T-Mobile’s Jump plans may be a better deal than Next or Edge, but just because Jump beats a low bar doesn’t ultimately make it a good deal. By buying your phone either up front or through installments, you not only keep your phone at the end — which you can then sell, give away or use as a backup — but you don’t have to worry about timing your upgrade. On T-Mobile’s regular plans, if you want to wait 13 or 14 months, it doesn’t matter. You own your device and you’re not paying any more for it. But Jump’s value quickly diminishes the longer you wait. By month 16 or so, you’ve actually paid more for your device than it was actually worth when it was new. With T-Mobile’s regular plans, however, you can buy your device up front or spread the payments over 12 months, 18 months or 24. If at some point you want to upgrade, simply pay off the remaining balance. If you really are looking to get a new phone every six months, then Jump would offer you quite a bit of savings. Jump becomes considerably more expensive the longer you wait to upgrade, but the opposite is also true. Jump on a six-month cycle would save you $300 over what you’d pay if you bought your device outright. Factoring in T-Mobile’s new promotion, the savings and even bigger. You’re basically paying only $222 in device costs for an iPhone 5 over six months, compared to $332 under Jump’s regular terms. Granted, a six-month-old phone is considerably more valuable than a year-old one, but if you’re moving between devices that often, you probably have more smartphones than you know what to do with. So hyperactive smartphone upgraders, Jump is definitely the plan for you. Finally, it’s important to note that Jump is also an insurance plan, while Edge and Next are not. Insurance is not the same thing as an upgrade — you pay a deductible up to $175 and get a refurbished replacement of your old device. There are better deals out there for pure insurance, but if you’re in the market for both an insurance plan and an upgrade program, Jump is worth considering. Hello, I would like to add that the jump! program is also your insurance protection, it includes the equipment warranty extension, which covers any manufacturer issues and also the protection for lost, stolen or physical/water damage. Currently customers pay for those features 7.99 a month or 11.99 a month depending on the device, an iphone 5, note 2 galaxy s 4 etc are considered a higher tier and their insurance is 11.99, so actually acquiring jump! Will be a saving of 1.99 for anyone that is currently paying for insurance and is a user for one of this top of the line devices. Well, Jump sounds good, but are you sure it’s better than Jump? And it sounds like Jump could also be a good alternative to Jump. All right, but how does Jump compare to Jump? Thanks Loopyduck. Brain fart on my part. This has been corrected. I like the comparison, but for me StraightTalk is still the best plan. I live in one of their CDMA only areas and am purchasing the iPhone 5 at no interest over a 24 month period at $25 per month. My plan (unlimited text, data, voice) is $45 per month. Even if I pay for the phone in one year, the total price after one year ($1189) is very competitive. Of course I’m only getting 3G and no insurance, but the phone is mine to sell in a year if I like. I’m not sure what the ‘equity’ (or perhaps more accurately, residual value) would be, but if its only half of the purchase price, I am many dollars ahead of T-Mo, VZW, and AT&T. If I lived in an area where StraightTalk uses GSM and I could bring my own device, there wouldn’t be any comparison at all. I know that a lot of folks express problems with ST, but I’ve not had any problems at all. If you’re in a 3G or better data area, you can install Talkatone, which enables free voice calls through GMail. A lot more than just 100 minutes!